Accuracy is something that I have alwaystried to maintain and that is why I chose to work with Whispering Spirits. as the ethos here has always been about maintaining a standard of service - After all that is what clients are looking for. However it's becoming harder and harder to advertise services such as Psychic Readings or Mediumship Readings , because of the advertising regulations becoming stricter and stricter. I was so surprised to learn that recent changes mean not only do we have to put "for entertainment purposes only", but we now are not allowed to make any reference to ACCURACY. For instance, we are not even permitted to say that we strive to be accurate. Apparently, this implies that a psychic reading can be accurate, and without being able to prove that under scientific conditions, we are no longer allowed to claim that we try to achieve accuracy. Like all professions you get good and bad, however for readers and companies who have a great deal of faith in the spiritual, it is so frustrating when we have to advertise more as an entertainment business rather than an honest reliable caring spiritual service providing good quality readings to those who seek spiritual guidance. Personally I have never claimed to be 100% accurate, let's face it no one is perfect. However for readers who have a good track record and had consistent positive feedback from clients who are delighted with the service we have provided, it is very disheartening to have to make it look like its something that is being done as fun. A lot of people who seek the service of a psychic or medium are in real turmoil and turn to a trusted company that can help them resolve their issues or give them guidance on the best way forward. And it is our clients who tell us time and time again, that that is exactly what we've done. So to have to pretend that we have not helped people, because we can't prove in a science lab that we have done, makes us wonder what the real agenda is here. Far from protecting the public, recent changes I feel will make it harder for a client to choose who is reliable and who isn't, as in the past client testimonials were a good way to spread the word on effectiveness. 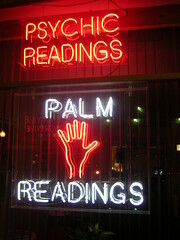 Testimonials we are told, are also not evidence that a psychic reading has been either accurate or helpful. Basically, your testimonials aren't considered valuable enough to support our advertising. Because when you had your reading, there was no scientist, telling you and the psychic what hoops to jump through to prove their abilities. It is good that regulations are in place however I feel it has to be done with the clients best interest at heart and personally I don't feel the recent changes achieve that. If anyone has any comments they would like to make concerning this matter I would be happy to hear from you.